6 full weeks of Skate Camp this summer: 1/2 days and full days available! WEEK 5: July 8 – July 12 . *skate camp fees are subject to local and state tax. When signing up, you can choose individual weeks, multiple weeks or the whole camp. Rental equipment is available. 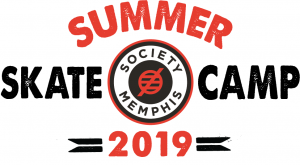 Copyright © 2019 Society Memphis. All rights reserved.